What is the point of being really rich? I feel that soon you must run out of things to spend your money on, but maybe it's the power that wealth brings that's important. 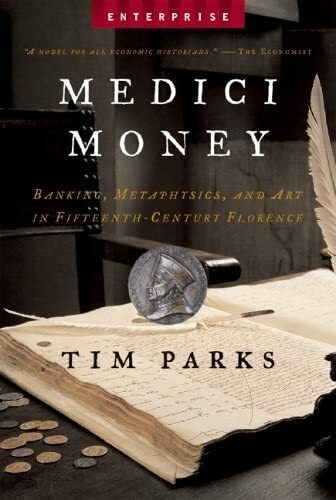 The Medici's were a very rich and powerful family, so I thought it would be worth reading this book to find out what it was that motivated them. I'm also interested in why some art fetches such high prices (Unfortunately for the artist the price increase tends to happen after their death). What benefit do people get from an old master to justify such high prices? Or is it simply a matter of investment? I'm interested in what the Medici's thought of their art purchases. Were they paying an artist a fair rate to produce something beautiful? Or did they too see the purchase as another way of making money? The book starts by looking at usury - in this context it means the charging of any interest at all, not just excessive amounts. The Medici's were active Christians, and the Christian church outlawed the charging of interest. But as bankers, charging (and paying) interest was an important part of their business. Somehow they had to work out how to deal with this contradiction. And I thought the financial world today was complicated. It's interesting stuff and I'm looking forward to the rest of the book. The book squeezes five generations of Medicis into just 250 pages, and I have to say it did seem a bit rushed at times. That was mostly at the start though, when you're getting new people introduced into the story at a rapid rate. As the book goes on I felt that this became less of a problem, as I began to get more of a feel for what was going on. Out of the five generations, there are just two main actors, that is Cosimo and Lorenzo the Magnificent. Cosimo spent his life building up Medici power, but tried not to get into the limelight to much. But this led to future generations having a different attitude, they took money for granted (although their financial base was shrinking) and concentrated on getting to the top politically. The book did answer my question as to the point of being really rich - it's to gain political power. For those running a bank there was a constant tension between investing money in the most profitable ventures and lending it to those at the top, even if they might not be very good at repaying their loans. One thing I found interesting was the way the Medicis tried to turn republican Florence back to aristocratic rulers. Although the elections were designed to prevent a small group gaining power, it wasn't that difficult to get round them. Such refeudalisation seems to me to be the path of many societies if it is not strongly resisted. It seems that purchasing art wasn't seen as a financial investment, more of a spiritual investment. The rich were well aware that their religion disagreed with their gaining of wealth, but it seems that using some of this wealth for religious art could offset this. There was also a move towards more secular art, but this went along with other Renaissance ideas such as finding links between Christianity and Greek philosophy. There were those, such as Girolamo Savonarola who called for a purer religion, and who got the upper hand for a while. In the wider conflict, however, the Medici's did well, with a Medici pope, and gaining the aristocratic position they had sought. In summary, if you can deal with the rather rushed feel of the narrative, the book contains much of interest.